Is Novation Lauch pad compatible with studio One ? Any MIDI Controller will work with Studio One, the list of predefined devices is only a short list. There are thousands of MIDI Controllers out there. Just add your own. 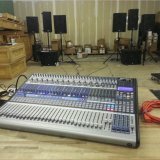 Is it Mackie Hui Full compatible with Studio One? Scratch Pad is Crashing in Studio One 3.0, is there a fix? Novation VSTi in Studio One 3? Are Notion sound banks compatible with Studio One?